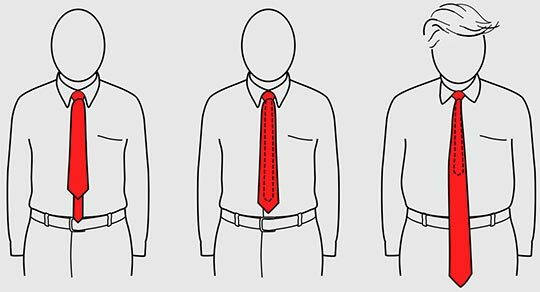 When putting on a necktie, getting the two ends at the correct length can be a time-consuming, trial-and-error process to prevent the front from being too short or too long. As a solution, the tie manufacturer can stitch or print reference marks at two places on the tie, which are visible just below the collar before tying the knot. When the tie is adjusted to bring the reference marks to the same height, the necktie will tie properly. The reference marks will be hidden inside the knot. This is not a product for sale, but is shown as an example of technology which clients can now expect from Steve Hines on a contract basis.